Gale & Co. offer a bespoke picture framing service. 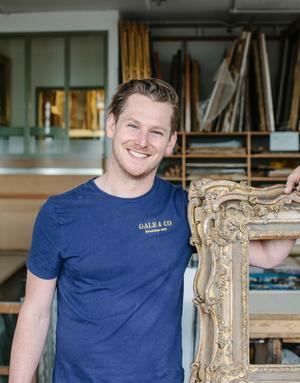 Gale and Co. offer a bespoke framing service and carry a stock of over 800 moulding patterns, both factory finished and bare timber - which are used as natural wood or for gilding and hand finishing. For early works, they have a comprehensive stock of period and antique frames which can be dated to marry with customer's pictures. They use both hand and machine joining techniques and offer all kinds of mount cutting. Lead time and costs are project dependent and their staff are more than happy to advise on the best framing solution for your job. Open five days a week 8.30am-5.30pm they close for lunch from 1-2pm each day. For over 170 years Gale & Co. have been the premier frame makers and picture restorers in Birmingham, manufacturing frames from 59, Moor St for a hundred years, before moving to Lee Bank Business Centre Holloway Head in 1959. They have over 4000 sq ft of workshops, enabling them to carry substantial stocks of moulding, frames and mount boards, and a highly experienced, expert work force who keep up to date with contemporary developments while reaching back into the early 18th century.